Paul Semakula proves why he wears the captain’s armband as tanners are held to a dull scoreless draw! 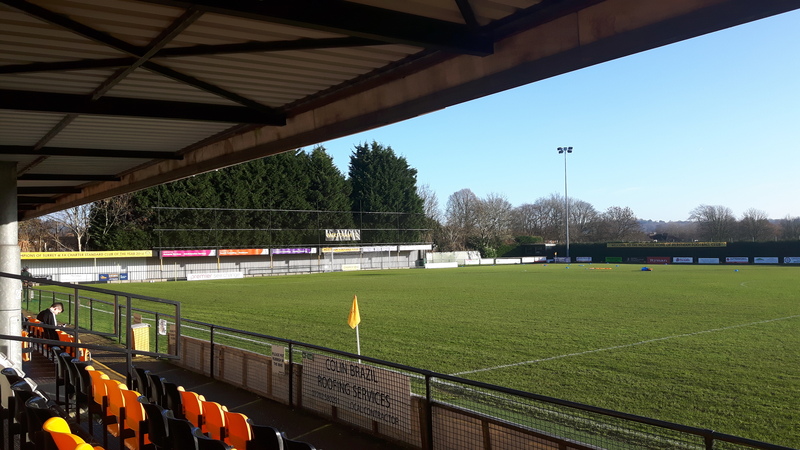 Line-up Merstham: Phil Wilson, Simon Cooper, Kristian Campbell, Douglas Antone, Tutu Henriques, Tom Kavanagh, Michael Abnett, Dan Bennett, Dean Mcdonald, Callum Willock, Dan Hector. Subs: Omar Folkes, Ryan Fowler, Rea, Bailey- Allen, Yoann Fellrath, Josh Smith. Line-up Leatherhead: Louis Wells, Adam cash, Danny Murphy, Paul Semakula (C), Chris Parr, Rian Bray, Kadell Daniel, Tyron Smith, Anthony Mendy, Richard Seixas, Mohamed Sagaf. Subs: Calum Davies, Jerry Nnamani, Dean Theobalds, Louie Downey, Nana Boakye-Yiadom. Twentieth place Merstham entertained Jimmy Bullard’s Leatherhead on the 2nd of January, a new year and a new signing (Yiadom) this game was always on the cards to be a cracker, despite both teams only getting a point each, the game was tense but jimmy looked at the positives overall. (82) No.5 Booked for trying to trip Yiadom, the defender ends up falling over himself in the end. (90) The 4th official indicated a minimum of 4 added minutes. Despite the result, Jimmy said “It’s good we’ve got our first clean sheet in a while” When asked about how the midfield was shaping up “Paul (Semakula) and Ty smith were great in midfield today, the two combined well with the outfield players” It was the 3rd game in the week, he said “It was Tiring, you could see it in the training before the match that it wasn’t as zippy” To check the full interview out head over to the Facebook page to see it! Louis Wells- 7/10 Not much to do, yes his goal kicks could’ve been more accurate but he made a few phenomenal saves to deny Merstham a goal. Adam Cash- 6/10 Was impressive first half but couldn’t prove to be the difference in the 2nd half and went quiet. Chris Parr- 7/10 Not much to do all game however did block a vital shot from Willock in the dying minutes. Rian Bray- 8/10 Tremendous performance by the Millwall Loanee, the centre half intercepted, headed away and blocked a number of shots/ passes, the youngster also cleared the ball off the line. Paul Semakula- 9/10 No words would describe ‘Paulie’s’ Performance, the strong midfielder not only defended well but he pushed the team forward, Paul also won the possession off the midfield on many occasions. Danny Murphy- 8/10 Danny Murphy or should I say “Mr consistent” the Full back, lead the team verbally, played some great passes, defended well and even made some dangerous crosses. Richard Seixas- 5/10 Richard returned to the lineup replacing Dsean Theobalds, the young attacking midfielder was quiet and made little impact, was replaced just after half time. Anthony Mendy- 4/10 was counted offside 4 times then was subbed with over 20 minutes remaining, the striker had 1 great opportunity but blasted it high and wide, disappointing. Mohamed Sagaf- 6/10 The versatile winger couldn’t have done a lot against the tall and strong Merstham defence but when he did get past the defence he created 2 potential goals with his skills. Tyron Smith- 7/10 Ty in the first half made some fantastic long balls which were highly accurate, the defensive midfielder may have wasted a free kick but did retrieve the ball when needed. Kadell Daniel- 6/10 Not his best performance this season as he missed an open goal from Sagaf’s cross, lost the ball a couple of times upfront but did get into a couple of positions where he could’ve scored.